Alno specializes in Decorative Hardware, Bathroom Accessories, Mirrors and Mirror Cabinets. Alno offers a huge assortment of shapes, styles and finishes for the most discerning taste. 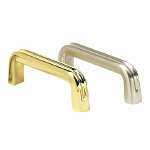 Decorative door and cabinet hardware is available in a variety of coordinated finishes, including knobs, pulls, rosettes, backplates, door hinges, door stops and more. Each bath accessory collection offers a variety of coordinated items, including towel bars, racks, hooks, rings, tissue holders, shelves, soap dishes and more. Our goal is to provide the most comprehensive collection of Alno products on the web.